Nepris is a national web-based platform that bridges the gap between classroom learning and the workforce. Students who struggle to make the connection between classroom curriculum and career risk becoming disengaged. Teachers encounter barriers such as transportation costs and time restrictions when planning class field trips. Go to the Nepris website. How is Ochsner using Nepris? Ochsner employers frequently offer online industry chats on their topics of interest. Any teacher interested in the topic can sign up to join the video chat. On the other side, teachers can also submit requests. Education Outreach works with Ochsner employees to match teacher requests with employer expertise. Download instructions on how to request an Ochsner chat. If you are an educator who would like to connect specifically with Ochsner medical professionals, please see attachment for further instructions. What is the Ochsner Impact? In partnership with GNO Inc. and the Louisiana Department of Education, Ochsner Education Outreach set out to encourage utilization on the Nepris system. 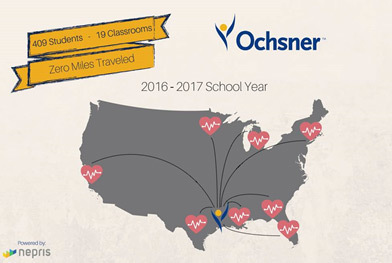 Without leaving their departments, Ochsner employees reached over 409 students in the 2016 – 2017 school year. Nepris chat topics have included Hand Hygiene, Clinical Laboratory Science, Psychiatry, Radiology, Telemedicine, Hyperbaric Therapy, Diabetes Awareness and Prevention, Professionalism in Healthcare, Digestive Health, Donating Blood, and many more.